England has its pubs, which I love. 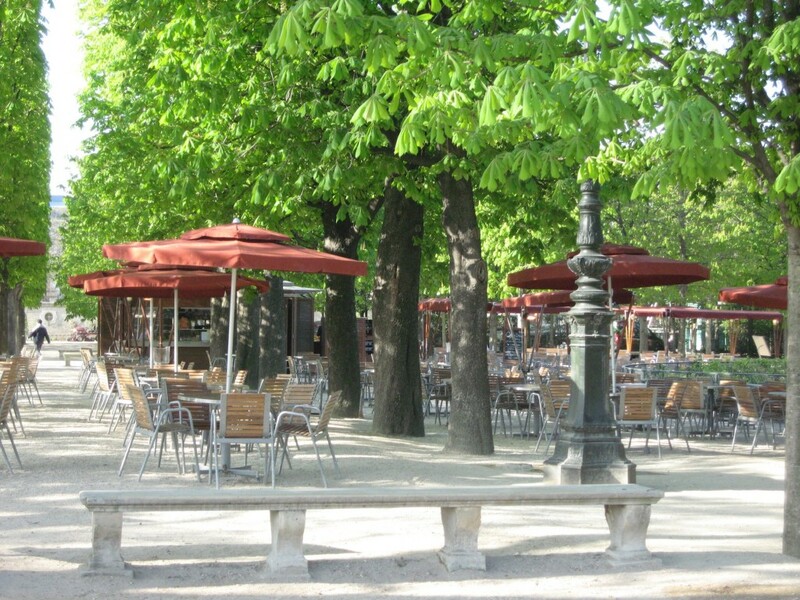 The Paris equivalent is the outdoor cafe, with a distinct personality all their own. There’s at least one on almost every busy corner in the city. Since the start of my visit, they all seem to be full, and the temperatures have been in the 50s to low 60s. 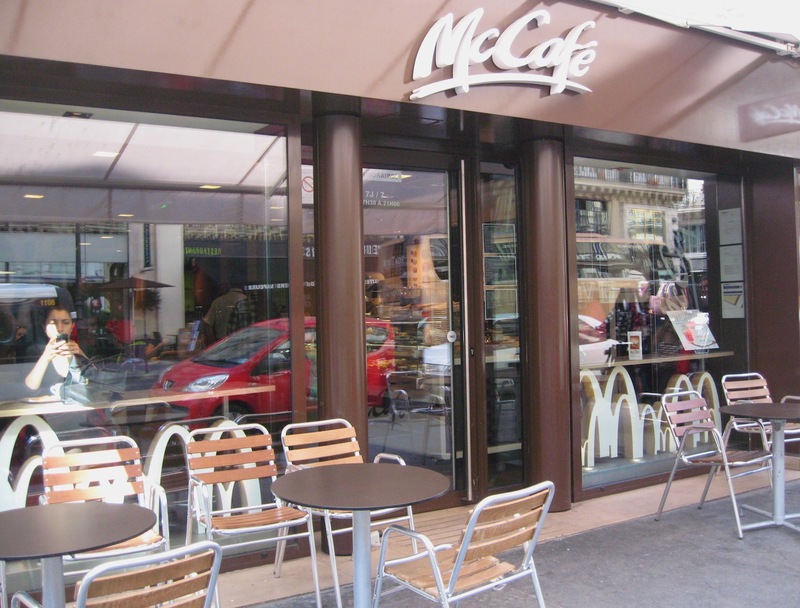 But Parisians love sitting outside at the cafe watching the world pass by. This particular one I saw on my first full day in Paris. It was right outside the Comedie-francais (France’s National Theater) and quite near the Louvre. 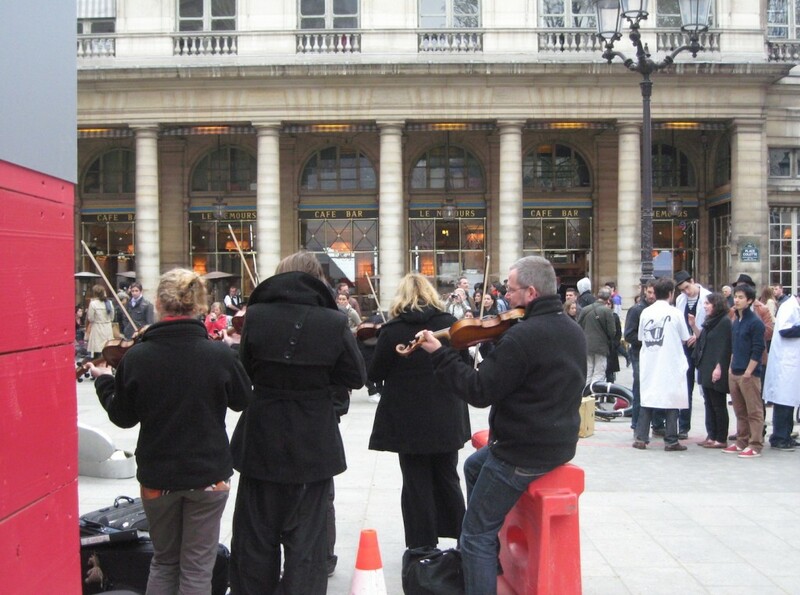 A group of very talented musicians was entertaining the crowd with classical music while trying to sell their recordings. 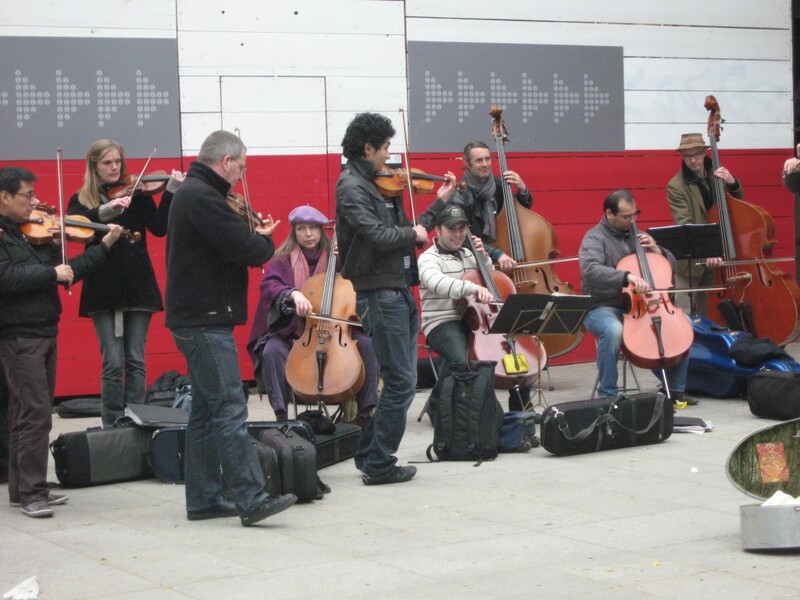 They did attract a crowd, and it was quite a gathering of amazing talent on the street. They really were very good and stayed quite cheerful seeing that is was chilly outside. I am sure the cafe didn’t mind one bit. Often you see street performers near a large open air cafe. Definitely a symbiotic relationship. 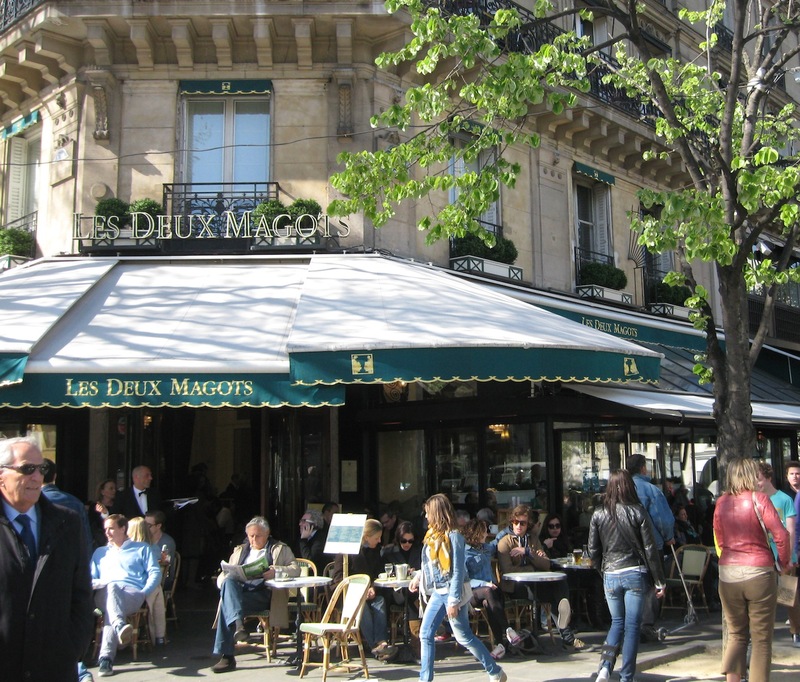 Les Deux Magots and Cafe de Flore are two of the most popular cafes on the Left Bank. 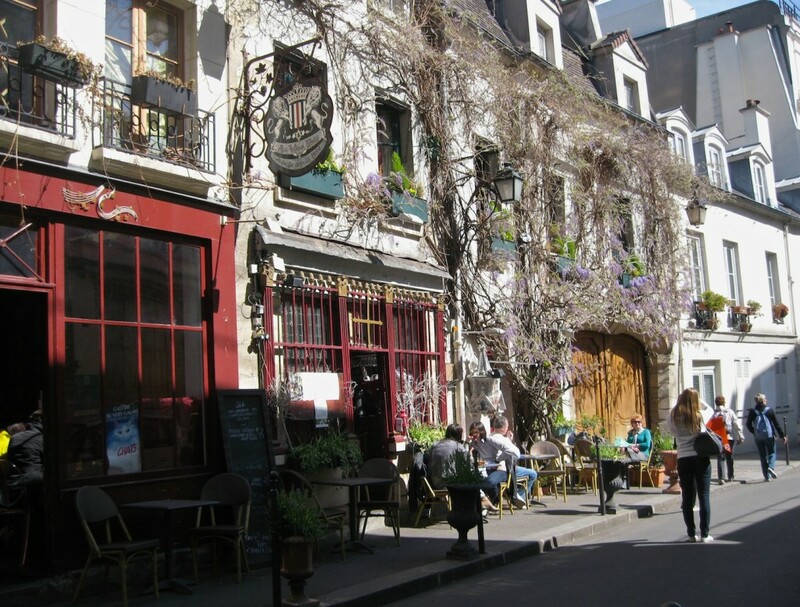 After winding through the little narrow streets near the Seine , I came across them both on this gorgeous wide Boulevard St. Germaine where they are located a block apart. They have had the reputation for decades of attracting a great literary and intellectual clientele, beginning with Ernest Hemingway in the 1920s and 30s, and existentialist philosophers and writers in the 50s, including Jean Paul Sartre and Simone de Bouvier. You can just imagine the conversations that took place over a few drinks. 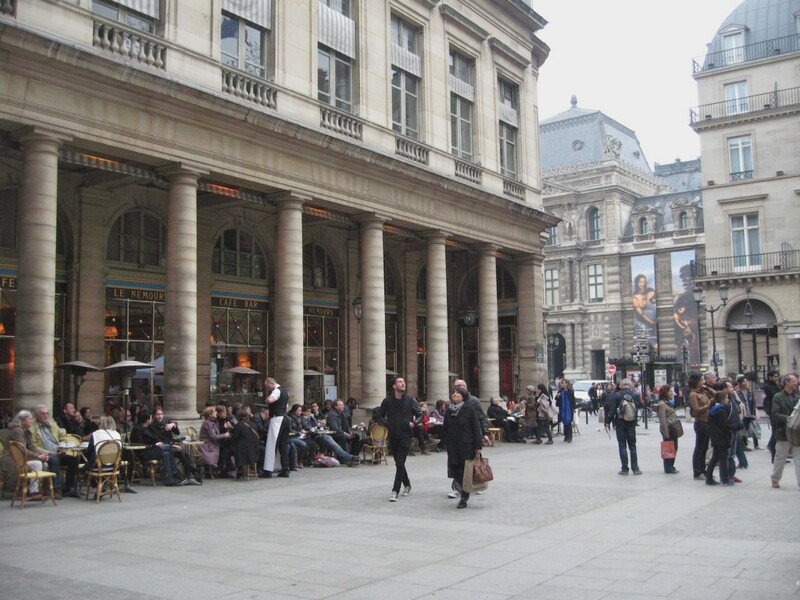 The Sorbonne is nearby which can’t hurt cafes reputations for great thoughts occurring around their tables. 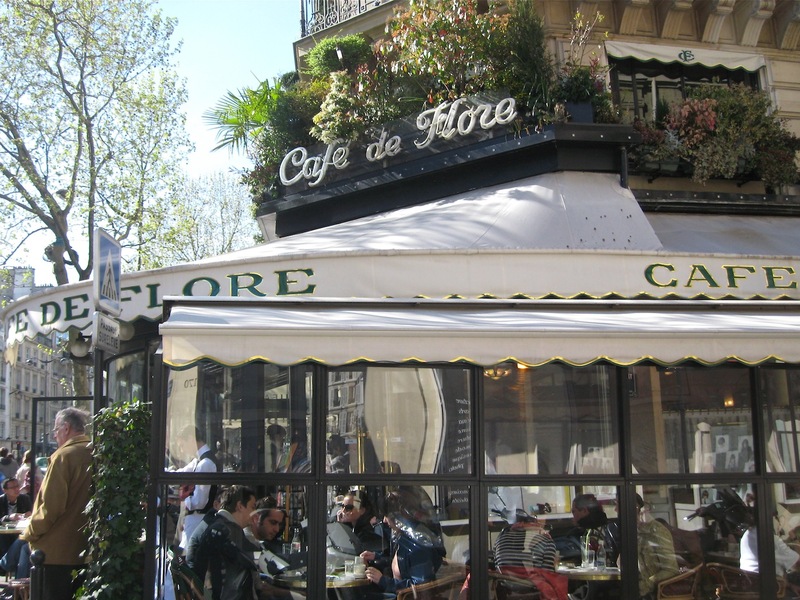 One of the most charming cafes I saw was on Ile de la Cite, right around the corner from Notre Dame. With just a few seats outside, it was none the less attracting a clientele that adored the sunshine under its wall of barely blooming wisteria. A charming neighborhood cafe on Rue Chanoinesse, one of the oldest neighborhoods on Ile de la Cite. Racine lived here. Photo by me. My favorite cafe to get coffee in the morning is just a short walk across from my hotel. It looks empty now, but by lunch time it will be packed if it’s a nice day. By noon the entire park was a mob scene. The temps shot up to 59 degrees! Photo by me. The MacDonald contribution to the cafe scene. 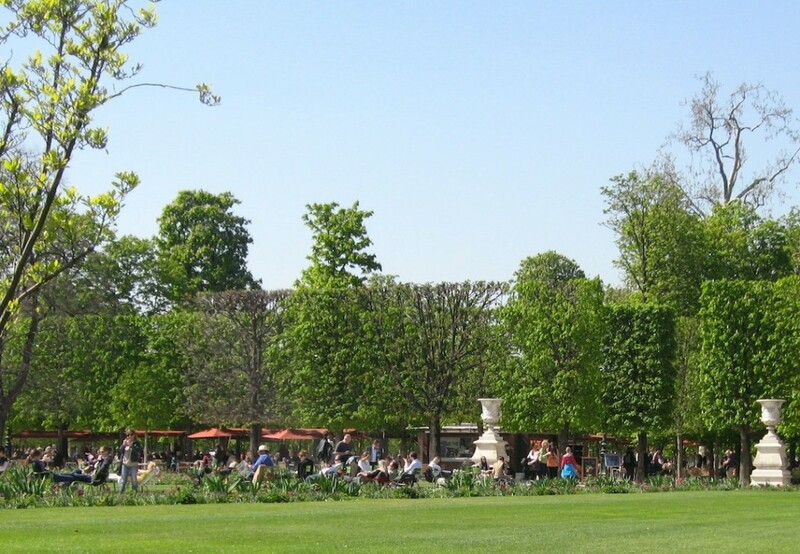 This is right down the street from the first cafe near the Louvre, where the musicians were playing. photo by me. Somehow it is just not the same thing at all. Sad but true, it’s time to head home. Luckily I have My Beloved Brit waiting for me at the airport tomorrow. That makes it bearable.